I was sitting down to dinner tonight with herself in a new ‘galbi’[i] restaurant so new they weren’t even sure how to start the grill, and as we were trying to enjoy the meat that was burning in front of us (courtesy of one of several teething issues for the new place), and I thought out loud, ‘what makes a good barbecue restaurant’? The ‘barbecue restaurant’ I am of course talking about is Korean barbecue, or galbi (pork ribs), or samgyubsal (pork belly with three layers of meat…or is it fat? ), or galbisal (beef), or sogalbi (beef ribs) or… or… or… the list of options for restaurant choice is long but the desired effect; meat + grill + beer = satisfaction, remains the same regardless of your choice of meal. As a westerner or should I say more accurately, a foreigner (that’s what I am in Korea) or a waeg (which is short for waeguk which means foreigner), this mealtime is possibly the strongest bonding point that many people will encounter in their one or twenty years in Korea. They may find something greater later in their sojourn, but in all honesty, how can any experience compare to the first time that you sit down around the round table where the first long piece of pink pork is laid on the steel, sizzling furiously with satisfaction on the instance of touchdown. The following hour or two of jabbering and drinking cement the team building exercise further and before you know it you’re sharing a microphone with a man/woman you met for the first time three hours ago, singing like you’ve shared the same stage for years, if not decades. Name me a sport that builds character as much as a random Tuesday night samgyupsal and soju session and I’ll gradually hand it over and suddenly not be touching on one hundred kilos of prime Irish steak. ‘What makes a good barbecue restaurant’? Well, it is this kind of question that stops many people in their tracks and think, ‘well yeah, right, it’s the meat of course’. ‘What are you talking about? That place down the road has terrible portions but the old lady who runs it is as sweet as can be and always gives extra mushrooms when we ask, and we go back there more often that we go here’ says the lad sitting across from him. ‘Yeah, that’s because it’s 9,000 won[ii] per portion of samgyupsal and the kimchi isn’t even spicy’ Replies the younger but astute looking client. ‘So how come we think that this place isn’t good but the other place with the crappy meat is nicer?’ replies the first man. ‘They’re both dumps to be honest’ says the second. A conversation such as this, with differences in between, may follow any suggestion of what makes a good spot to grill your meat. And that’s the thing, there are so many reasons why we take to particular restaurants, and when you live far from the lures of Itaewon and its bars your local ‘galbi’ spot is almost like a local pub where you can meet. You know the owner and the owner knows you so they don’t mind when you fall off your stool blind drunk at four in the afternoon. The restaurant has ‘character’ or what you might think of as character but a person with actual taste would probably see as a serious identity crisis (middle age women running around handing out bottles of beer and posters on the wall of underdressed models politely suggesting that if you drink this it is quite likely that you will end up in bed with them tonight). For whatever reason it is, these places keep calling you back. In Korea there is a definite belief that the grottier the restaurant the higher quality the meat is, and there are places all over Seoul with sawdust on the floor that charge you 40,000 won for two hundred grams of beef, and you are treated to an exceptional meal. While you could wander into a brand new and well polished place and pay a quarter of the price and leave wanting your money back and letter of apology for the excuse for a meal they have attempted to pass off on you. I’ve had a few ‘local’ places, which incidentally have never been that ‘local’ but have always treated me well and left me satisfied, and I have the company that came with me to thank, firstly for providing memorable conversation of which I can remember nothing, and secondly for showing me these great spots. There was a place near Hanyang University that charged 3,000 won for samgyupsal and the portions and side dishes always tasted like more, there was never any shortage of kerrangdjim or dwengdjang ziggae, the lady always smiled and never had a problem giving us drink even after a certain someone passed out pissed drunk in the corner before he had a chance to realise he was having dinner. This was a classic place, a real gem and a secret which I hope, purely for romantic reasons only, that no other waegs have realised the potential of this little prefab/tent restaurant in the middle of twenty other similar restaurants in a lively university area. There was another place I liked too in Daehangno that was an actual building itself, unlike the corner of the street place mentioned above. Nice heavy wooden tables, real charcoal fires, not a huge amount of side dishes but lots of staff to get you a beer if you instantly got extra thirsty. The meat here was good quality and it was the first place where I was introduced to the vinegar and onion sauce (at least I think that’s what it is) that you could dip your beef in and then wrap up in lettuce and lob into your mouth. This place was never lacking with the portion sizes and was right across the street from a couple of good bars so we were never left wanting for something to do post-dinner. ...and this is how it can look a little closer to the end. Good things always come in threes, but I’m left with one last place to fill the circle because there are so many great places that I’ve been to over the years, in Jongno, Hongdae, even around Itaewon, and of course there was a wonderful all you can eat place in my first neighbourhood in Seoul, Sinnae-dong. I reckon, the last place I should mention is every place that I’ve left from with a smile of satisfaction, labelling the restaurant ‘Job Well Done Available Here’. I can’t finish without making an example of two places that I believe to be over-rated and not worth the overpriced land they reside on (or under as the case is here). These are Don Valley and what I only know as ‘the totem pole’ restaurant, both in Itaewon and both on opposite sides to the street to each other. Don Valley is under what used to Burger King and is now Coldstone or something like that, and ‘the totem pole’ restaurant is at the entrance to alley behind Geckos. I don’t think I’ve ever seen any of the staff happy to serve me or my friends here, nor have I ever been satisfied with the meal. It’s usually over priced and poor quality with over elaborate side dishes that even the Korean people with me find odd or unappetising, especially when eating samgyupsal or whatever it is we’d ordered. Sure I’m probably nit-picking at these two last places, but what do I care? I know for a fact that if I want to have good Korean food, Itaewon, as in the main drag, is the last place I’m going to go. Take it from me, walk down to Bokwondong, Hannam, or around the corner to Gyeongridang and you’ll find fantastic restaurants with great value and real atmosphere where the staff don’t mind serving you a seventh bottle of soju at lunch (perhaps an exaggeration). And if the best barbecue restaurant in Korea ever exists on paper, I’m sure I’ve eaten in a better one. 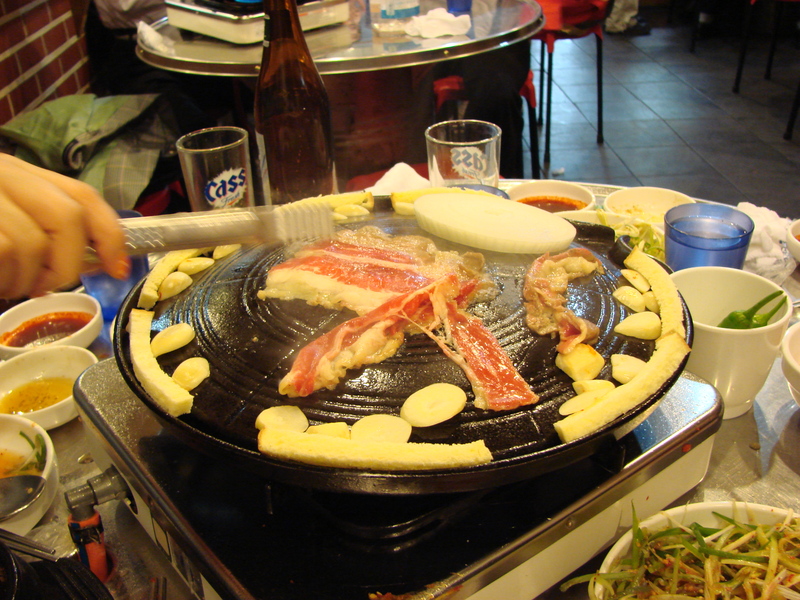 [i] ‘Galbi’ in terms of restauranting in Korea generally refers to Korean barbecue. The real galbi refers to barbecued ribs, but I think people just found it easier to make this the general term, a bit like vacuuming/Hoovering and photocopying/Xeroxing. [ii] You can work out the exchange rate yourself! 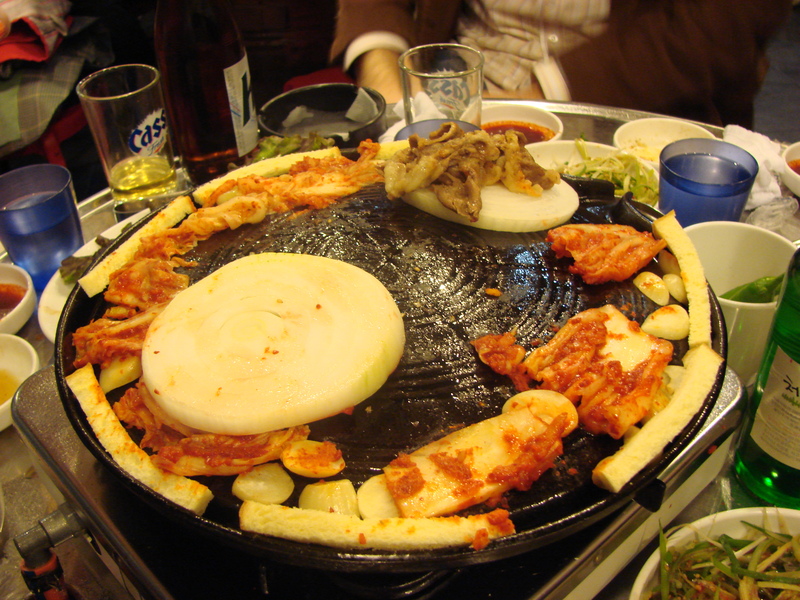 This entry was tagged food, galbi, restaurant, samgyubsal, South Korea. Bookmark the permalink. No doubt there are some Korean restaurants near you, there are a couple of good(ish) ones in Dublin that I’ve reminisced at more than once at! I have a love-hate relationship with soju! Far from the case with g-g-g-g-g-gooogggiii! A random place a friend in Yeoju took me too stands out for me, they have the traditional style Korean barbeque but also had sort of western style BBQ sauce and honey mustard. I can’t quite explain exactly how to find it but it’s down a road that turns into a dead end and across from a type of smallish amusement park.